Master Bathroom with roll-top bath, sink, toilet and bidet. En-suite shower room off Bedroom 1 with toilet, sink and shower enclosure. A fabulous new Clearview log-burner; a starter supply of kiln-dried hardwood logs are provided, more are available to purchase. The lounge is open full height to the beams. The lounge is furnished with leather sofas, and is equipped with TV, Freeview recorder and MP3/CD player. The property has central heating but there is also a log-burner in the lounge for a cosier feel. A newly-renovated large family kitchen with a flagstone floor. It contains all the essentials to make family holidays easier including Induction Range with double oven, fridge-freezer, dishwasher, washer, dryer, microwave, etc. Plus a sofa to relax on. Notes on accommodation: The Barn has been awarded a 'Families Welcome' rating; accordingly we offer a travel cot, stair gates, pushchair, high chair, and baby monitor if required. Free WiFi is now available in the Barn. The Barn is a no-smoking and pet-free property. Outside: Outside, the Barn has an enclosed cottage-style garden with a lawn and a patio area with a charcoal BBQ for your use. There is off-road parking for 2 cars but ample parking is available very close by. Cleaning / Towels / Linen / Maid service: Towels and Linen are included Other: A Snug adjoins the lounge and offers more sofas, a second TV, DVD and Video player, along with selection of books and a computer games console. Upstairs, a children's play-loft with a selection of toys can be accessed via the secret ‘Mousehole’! Weekly lets begin on a Fri / Mon for 7nts. Short breaks are available for 3nts beginning on a Fri, or 4nts beginning on a Mon. Large, comfortable house, very well-situated for walking and cycling. Only 10 yards from the village pub - ideal! Highly recommended. Absolutely delightful renovation with tons of character, beautiful modern conveniences, comfortable beds with nice linens, excellent service from the owners and property managers. You really couldn’t ask for more in a vacation rental - except perhaps a bit more bathroom space but we made that work out fine! The cottage has such character and we felt completely at home there. Lovely spacious barn (or was it once a coach house for the inn next door - which could well have been a coaching inn?). Lots of space - great kitchen - comfortable living areas - excellent welcome tray and, of course, the mousehole and children's play loft was a hit with the younger members of the party. 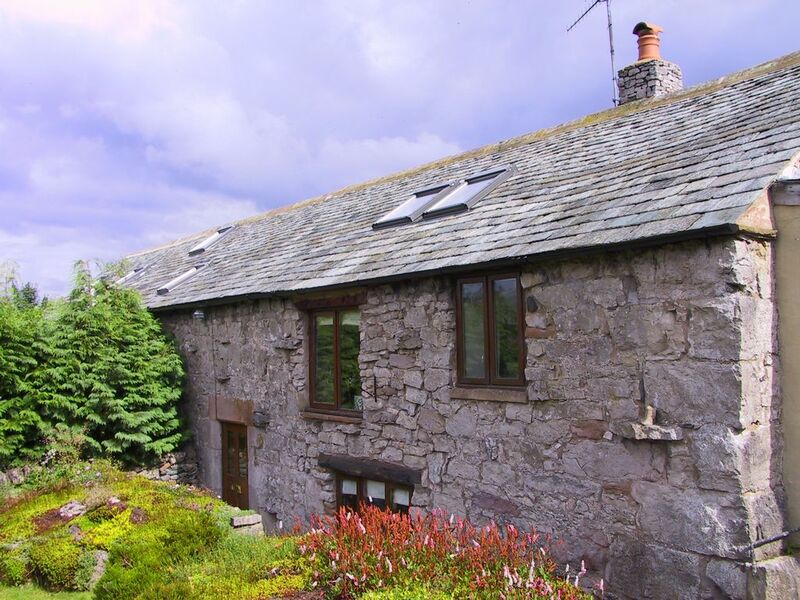 Very well situated between the M6 and Ullswater. Greatly enjoyed by all seven of us. A cosy spacious traditional barn conversion with many original features. Spent four nights here in late Oct/early Nov - and enjoyed the cosy comfortable rooms during those first few dark winter nights. Plenty of bedroom space for six of us, and lovely to have option of two sitting rooms - we mainly used the one with wood burner. (we bought wood and didn't find the starter pack listed). We didn't use upstairs dining area - tending to eat in kitchen which was easier than carrying meals through two rooms and upstairs. Main bathroom being downstairs was a pain with four children but we managed. Ensuite in huge master bedroom was tiny and had two louvred doors with loo just inside which seemed very odd. Shower powerful and lots of hot water though boiler incredibly noisy! When it kicked in overnight it was a bit like a plane taking off. Younger children enjoyed the climb up to the secret play loft. Overall comfortable house with all you'd need for a weeks stay & some interesting local attractions. If required, we can offer Outdoor Pursuit courses, such as Ghyll Scrambling, canoeing, Cycling, Hill walking etc, led by an accredited local company. Please call for details. Dacre Garth lies in the heart of Cumbria within the small friendly village of Stainton. The Village boasts excellent food at the King’s Arms Public house and the Brantwood Hotel. Within a short walk is the renowned Greystone House Farm, stocking local and organic produce ranging from pasta and preserves, to fresh bread, milk, vegetables and its own butchery. The tea-rooms above the farm-shop are also highly recommended for lunch or an afternoon snack. Booking Notes: All bookings are available via our website. 25% desposit required. full payment within 6 weeks of holiday date Changeover Day: Weekly lets begin on a Fri / Mon for 7nts. Short breaks are available for 3nts beginning on a Fri, or 4nts beginning on a Mon. During peak holiday periods short breaks will only be available as late bookings. Check out time is 10am on the day of departure. Notes on prices: Prices, which include lines, towels, utilities and a starter supply of firewood, vary depending on season. Typically, Off-peak prices begin at £670/wk, £465 for a short break. Peak rates begin at £1200/wk, £835 for a short break. Please contact us for latest pricing, availability and for information on available offers or last-minute bookings. We are happy to accept provisional bookings via telephone or e-mail which will then be confirmed upon receipt of deposit or full payment.